[166 Pages Report] The 3D motion capture market was valued at USD 111.6 Million in 2016 and is expected to reach USD 204.0 Million by 2022, at a CAGR of 10.28% during the forecast period. The base year considered for the study is 2016 and the market forecast is provided for the period between 2017 and 2022. 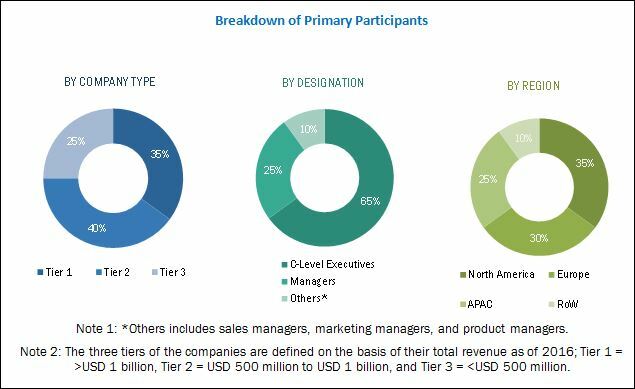 To forecast the market size for various segments and its subsegments with regard to four main regions North America, Europe, Asia-Pacific (APAC), and Rest of the World (RoW). The research methodology used to estimate and forecast the 3D motion capture market includes the use of extensive primary research and secondary research. The secondary sources referred for this study includes directories; databases such as Hoovers, Bloomberg BusinessWeek, Factiva, and OneSource; and associations. The vendor offerings have been taken into consideration to determine the market segmentation. The top-down procedure has been employed to arrive at the overall market size of the global 3D motion capture market. After arriving at the overall market size, the total market has been split into several segments and subsegments, which have then been verified through primary research by conducting extensive interviews with key people such as CEOs, VPs, directors, and executives. Data triangulation and market breakdown procedures have been employed to complete the overall market engineering process and arrive at the exact statistics for all segments and subsegments. This report provides valuable insights into the 3D motion capture market such as hardware and software providers, services related to the 3D motion capture, and application segments. 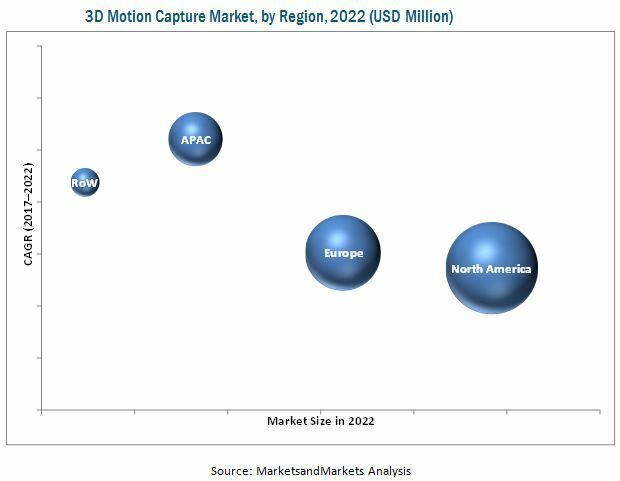 The major 3D motion capture market providers are Vicon Motion Systems Ltd. (U.K.), Qualisys AB (Sweden), Phoenix Technologies, Inc. (U.S.), Xsense Technologies B.V. (Netherlands), Motion Analysis Corporation (U.S.), OptiTrack (U.S.), Codamotion (U.K.), Phasespace, Inc. (U.S.), Synertial Labs Ltd. (U.K.), and Noraxon USA, Inc. (U.S.). The overall 3D motion capture market, in this research report, has been segmented on the basis of system, type, application, and geography. On the basis of system, the 3D motion capture market has been segmented into optical 3D motion capture system and non-optical 3D motion capture system. The demand for non-optical inertial motion capture is expected to grow in the future. The benefits such as lower cost, no marker occlusion, and high accuracy attribute to the growing demand for non-optical systems in the market. On the basis of type, the 3D motion capture market has been segmented into hardware, software, and services. In the 3D motion capture market, the hardware is one of the essential parts, and includes camera, sensors/ LEDs, communication devices, and accessories. Moreover, hardware accounts for the largest size in the market due to the wide usage of cameras and sensors in 3D motion capture systems for various applications. On the basis of application, the 3D motion capture market has been segmented into media and entertainment, biomechanical research and medical, engineering & design and industrial, education, and others. The others includes precision agriculture and sound and motion analysis. In agriculture, 3D motion capture systems are used for drone navigation and stabilization of drone to determine size and color of crops, so that the right amount of fertilizer can be applied, thereby helping in healthier food production. Therefore, these applications possess enormous growth prospects and provide huge market opportunities for the 3D motion capture market during the forecast period. Asia-Pacific (APAC) is expected to be the fastest-growing market for 3D motion capture systems, followed by the Rest of the World (RoW) during the forecast period. The 3D motion capture market in APAC is expected to grow at the highest rate during the forecast period owing to the increasing adoption of 3D motion capture systems for a wide range of application areas such as media and entertainment, biomechanical research and medical, engineering & design and industrial and education in developing countries in this region. Need of specific software and hardware for data processing is one of the restraining factor that hinders the growth of the 3D motion capture market. The captured images from the camera is limited within the capture volume without extra editing of the data. However, software are required to obtain a reliable three-dimensional (3D) data after capturing the motion data. Moreover, the movement and shape of the animated character needs post editing using the software to correct the errors and increase the quality of the captured images. Key players in this market focus on new product developments, strategic partnerships, collaborations, and acquisitions, to increase their revenue. For instance, in June 2016, Vicon Motion Systems Ltd. (U.K.) launched Vero and Vue camera, which is a part of the Vantage family group of the company’s product portfolio. Vero camera has high resolution, and provides significant power, performance, and flexibility to the users. On the other hand, Vue is a HD video camera for capturing clear and precise video recording in motion capture volume. 10.2.1.1 Major Players Dominate the 3D Motion Capture Market in the U.S.